Students and staff at the Central European University (CEU) in Hungary are protesting against what they say are government plans to close it down. The university says new legislation proposed by the right-wing Fidesz government on Tuesday night makes it impossible for it to function. 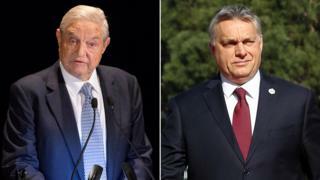 The CEU’s founder, philanthropist George Soros, has a strained relationship with the PM Viktor Orban. But the government says it supports the university and does not want it to go. The CEU, established and registered in New York State, is an independent, private university for masters and PhD students from more than 100 countries. If approved by parliament, the law would mean the university can only continue working if an intergovernmental agreement between US President Donald Trump and Hungarian Prime Minister Viktor Orban is signed, and if the university establishes a campus in the US by February next year. The first is unlikely – both Mr Trump and Mr Orban are sworn enemies of Mr Soros. The second is physically impossible. Twenty-seven other foreign universities will be affected by the legislation, Education Secretary Laszlo Palkovics told the BBC, and all must abide by the new law. Only the CEU has no campus in its home country, the US. It comes at a time of deteriorating relations between US President Donald Trump and Mr Soros, who recently described the new occupant of the White House as “an imposter, a [political] conman and a would-be dictator”.